Providing you the best range of artificial insemination gun, clinical artificial insemination gun, stainless steel artificial insemination gun, veterinary artificial insemination gun, ss artificial insemination gun and self locking artificial insemination gun with effective & timely delivery. Straw Used 0.25 cc straws and 0.55 cc straws. We provide Artificial Insemination Gun which is ideally used in medical industry for extracting and injecting a nucleus out of the cell. Manufactured using durable stainless steel, these guns can be used with any sheath. In addition, these Universal A.I Guns are used with both 0.25 cc straws and 0.55 cc straws. We also offer customization of products as per varied needs of clients. We offer a prominent range of Clinical Artificial Insemination Gun which is acclaimed by the clients for its high-grade features. Our range is featured with corrosion resistant, abrasion resistant and long functional life. These guns are widely used with the sheath. Quality tested this range is available in the market in both customised and generic pattern and that too at reasonable prices. Moreover, this range can also be used with 0.25 cc straws and 0.55 cc straws. 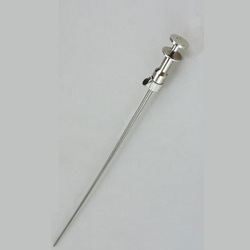 We provide Stainless Steel Artificial Insemination Gun which is ideally used in medical industry for extracting and injecting a nucleus out of a cell. Manufactured using durable stainless steel, these guns can be used with any sheath. 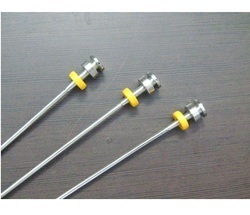 In addition, these Stainless Steel Artificial Insemination Gun are used with both 0.25 cc straws and 0.55 cc straws. We also offer customization of products as per varied needs of clients. We offer a prominent range of Veterinary Artificial Insemination Gun which is acclaimed by the clients for its high-grade features. Our range is featured with corrosion resistant, abrasion resistant and long functional life. These guns are widely used with the sheath. Quality tested this range is available in the market in both customised and generic pattern and that too at reasonable prices. Three Stainless steel tubes in the gun to give more strength. The sheath can be released by pressing release lever. Plunger locking device avoids falling of plunger during handling. it comes with a gun container. 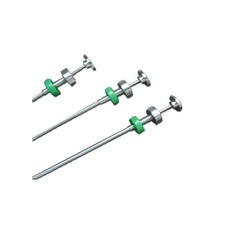 Self Locking Artificial Insemination Gun equipment used for Artificial Insemination in Cattle are available in varieties & various quality. AI guns have a special round hub for perfect sheath matching with the lock. Quick and secure assembly makes this product very comfortable to work with. Corrosion resistant, these products are compact and light in weight. Self Locking Artificial Insemination Gun can be used with 0.25cc and .05cc straw. The ring is not used, therefore no chance of misplacing it. Comes with a gun container.